Rows and columns on the knit side. Rows and columns on the purl side. Cast on stitches using Knit Cast On. We are going to begin by knitting flat, which means you will be knitting back and forth, not in the round. 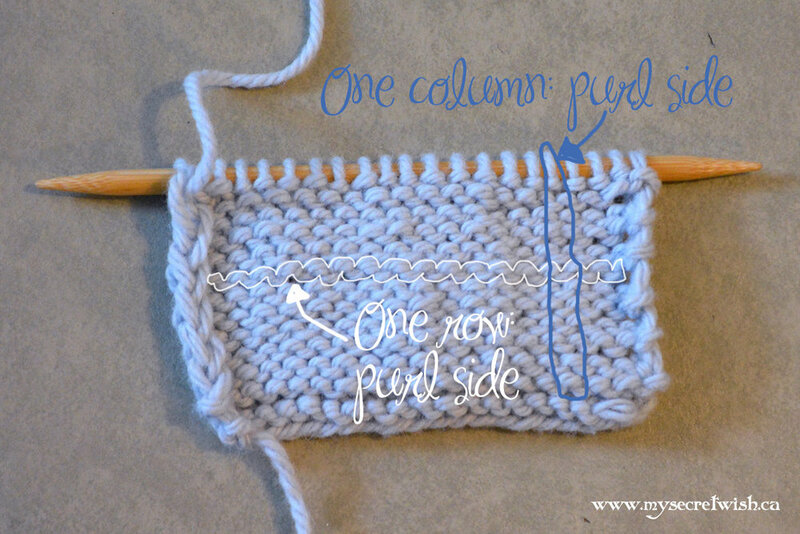 If you are right-handed, you will be casting on to your left needle, then working new rows by creating new stitches in the old stitches and dropping the old stitches off of the left needle*. In a way, it is like you are “transferring” your stitches from the left to the right needle. When all of your stitches on the left needle are gone, it is time to flip your needles around, put the needle full of stitches in your left hand, and start all over again. *Lefties will be working the opposite direction. Since I am right-handed, all of my tutorials show only this direction. However, lefties have often used the trick of looking in a mirror to duplicate what they see in knitting tutorials designed for righties.